The Republican National Convention in Cleveland this July is shaping up to be one of the most interesting in years, however GOP Sen. Mark Kirk will not be attending. 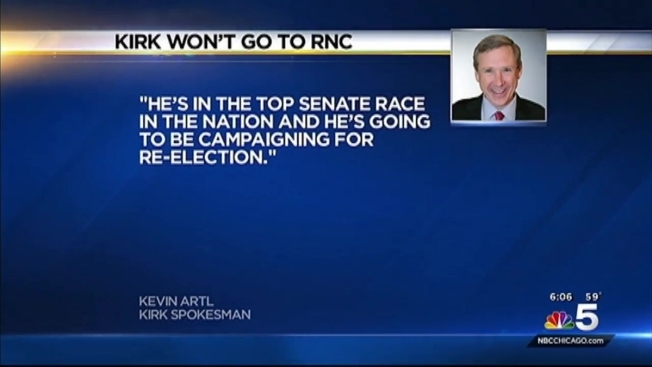 Kevin Artl, a spokesman for Kirk, confirmed to NBC 5 that Kirk, who is in a fierce re-election fight with Cong. Tammy Duckworth, is skipping the event to focus on his own campaign. Kirk may not be the only Senate Republican who will be absent from the RNC. The Washington Post reports that New Hampshire Sen. Kelly Ayotte is unlikely to attend and South Carolina Sen. Lindsey Graham has not made definite plans. Days before the Illinois Primary in March, Kirk told NBC 5 that if Donald Trump is nominated he would support Trump.